or a handset for bare conductors. Provides talk power for handsets on "dead" line circuits during installation. Tests continuity to 10K ohms and voltage from 5 to 48 volts AC/DC. 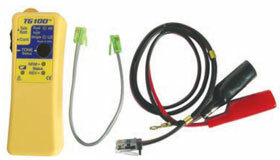 Provides polarity (tip and ring side) indication of the central office battery at the protector or modular outlets.